Good ol’ Delver of Secrets. For as long as this little Human/Insect has been around, people have been trying to make him work in Modern. The format has reasonable interactive spells alongside a decent supporting cast of threats, but one problem has persisted: the lack of good cantrips. A tight banned list prohibiting the use of Ponder, Preordain, and Gitaxian Probe makes it hard to expect Delver to flip on a consistent basis. Not only do solid cantrips let you occasionally set up a Delver flip, but they also allow you to artificially lower your land count and threat count, all without losing consistency. Delver requires you to play a high density of instants and sorceries to even hope to flip him. Consider today’s deck as an example: with our land count (relatively high for a Delver deck) and our creature count (relatively high for a Delver deck) we are only about 30-35% at any given moment to flip a Delver. I don’t love those odds. After all this naysaying you may be wondering why I would even consider virtually sleeving up the little Wizard at all! Well, enter Wizard’s Lightning! Now we have an incentive to build a deck around! Playing seven or eight copies of Lightning Bolt with four copies of Snapcaster Mage is nothing to scoff at. In fact, Delver isn’t the star of the show here at all; he’s merely a weak enabler of a much more exciting strategy. The real innovation in this archetype is the Faerie package. 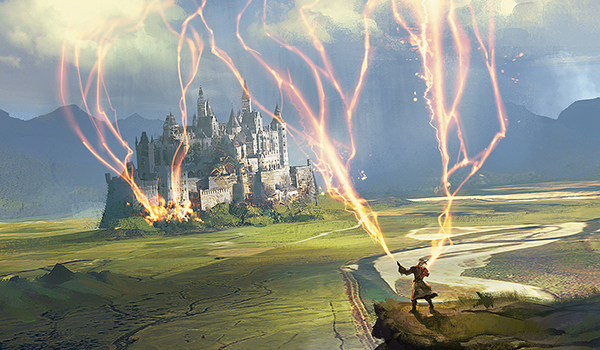 We’ve borrowed a bit from Pauper to make it happen, but Spellstutter Sprite enters the Modern field both as a reasonable threat/piece of interaction on curve and an enabler for Wizard’s Lightning. Vendilion Clique does all kinds of work here; it’s a Faerie enabler for Sprite, a Wizard enabler for Wizard’s Lightning, a good piece of interaction, and a solid threat. No matter what axis we’re looking to fight on, it’s pretty likely Clique does the job. Thus far, I’ve been way more impressed with this deck than I would have expected. It plays pretty smoothly and its subthemes are supported well enough that you rarely have trouble casting Wizard’s Lightning, countering something reasonable with Sprite, or finding a threat to beat down with. Yes, it would be better if there were some more solid cantrips to include; and yes, Delver doesn’t flip incredibly consistently. However, even with all that, the deck runs well and can end games quickly. Continuing the discussion of cantrips, I’ve gone back and forth on Serum Visions in the list. The original list that I saw on Twitter posted by Jeff Hoogland had no cantrips at all, but that felt a little too clunky for my tastes, and required the deck to play too many lands. I’ve also tried lists with Opt in the place of Visions. When you boil it all down, the Opt vs. Visions debate is centered around one thing: whether you more frequently flip your Delvers because of the deck manipulation offered by Visions or more frequently need to hold up interaction alongside Opt. I’ve found that I am rarely using Serum Visions to set up Delver and frequently wanting to wait on my cantrips so I can hold up Mana Leaks, Remands, and Spellstutter Sprites. As such, I am more likely to continue playing Opt in the future. The deck could certainly still use some tuning, but I think it could have some staying power. It takes a lot for me to register a Delver of Secrets in Modern, but I could see myself doing so with this new innovation. I hope you enjoy the matches as usual, and I’m interested to hear what kind of content you’d like to see moving forward so I can continue to evolve and improve my videos. Let me know what you would like to see! If you want similar content, check out my Twitch channel for some more live Modern.